What Will Your Job Be and Where Will You Live? Depending upon the many different military occupational specialties (MOS), or job, of the Marine, the United States Marine Corps has several options where a Marine can live. Though a majority will likely live in Camp Lejeune, Camp Pendleton, or 29 Palms, there are actually 20 different military bases in the United States, including Hawaii and Guam. More than 30 other locations include USMC Satellite Bases / Aviation Facilities, USMC Detachments (smaller bases) are located throughout the United States and other countries such as Japan, Afghanistan, Cuba, Australia, Diego Garcia, South Korea, Germany, and Djibouti. Of course, assignment opportunities depend on your Marine Corps job. 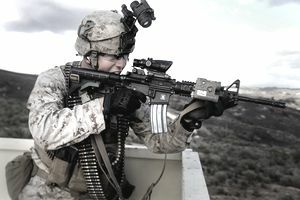 For example, if you're Marine Corps job is rifleman, you will be assigned to bases with an infantry unit such as camp Lejeune North Carolina. If your job is to repair F-18 aircraft, you would only be assigned to bases that have F-18 fighters such as Cherry Point, North Carolina. Marines assigned to stateside bases, generally must stay a minimum of three years before being eligible to move to another stateside base (there are exceptions to this rule). Overseas assignments have designated "tour lengths." For most locations, it's two years for an unaccompanied Marine, and three years for a Marine who elects to have his/her dependents relocated with them. Junior enlisted Marines (those who are on their first enlistment) who are assigned to Japan or Okinawa have more assignment restrictions. The tour length for unmarried junior Marines is two years (except for Camp Fuji, which is a 12 month "remote" tour for everybody). First-term married Marines (or first-term Marines with dependents) serve a 12-month unaccompanied tour. In a very few cases, these Marines may be approved for a 24 month accompanied tour. All other Marines served the standard tour lengths, which is 36 months for accompanied and 24 months for unaccompanied. While the normal Marine Corps assignment locations are rather limited, Marines (in any job), in the rank of E-2 through E-8 can volunteer for the Marine Corps Security Guard program, and be assigned to 12-month or 18 month assignment tours in more than 120 countries throughout the world in embassies and consulates with the United States Department of State. The Marine Security Guard (MSG) program and duty provides Marines the opportunity to be a part of a Marine Security Mission and provide protection to mission personnel. Preventing the compromise of National Security Information and equipment at United States facilities if foreign countries can be challenging rewarding and career enhancing. Recruiting Environment - Do your research during this phase of the process prior to joining. You should have an interest in a particular MOS and be patient in order to get the orders you prefer. Any acceptance of a job that you have little interest in can be a horrible military experience and extra work to transfer out of that job. Enlistment Incentives - Learn about all the benefits you can receive upon enlisting into the military. Where you will live? How long your training is? Where you could deploy? You should be flexible but have knowledge of the options available to you. Job Opportunities - Depending upon your MOS, you will have more or fewer opportunities for additional education, quicker advancement, and bonus pays. Basic Training - You should definitely prepare yourself physically for not just the physical fitness test, but also your body for rucking, obstacle courses, and other load bearing activities. Deployments - During times of conflict, you can count on deployments to war zones. Riding on a United States Navy Amphibious ship is also part of the equation when deployments are considered. Quality of Life - Depending upon where you live, the quality of life can swing especially if a junior Marine living in the barracks. Understand this when signing on the dotted line and joining to serve your country as it will largely depend on your personality and abilities to how you handle living in the Marine Corps. Promotion Opportunities - Understand what time in service and time in rank mean and be prepared for advancement exams when they present themselves. Also getting into trouble and having Nonjudical Punishment (NJP) can negatively affect your ability to advance with your year group and fellow Marines. Educational Opportunities - There are many educational programs for both enlisted Marines and Officers for college degrees and advanced degrees. By applying and being a competent Marine can be rewarded with free college. Enlisted Commissioning Programs - These free college programs also offer advancement into the officer ranks. Set yourself apart while enlisted and make yourself eligible for officer promotions.